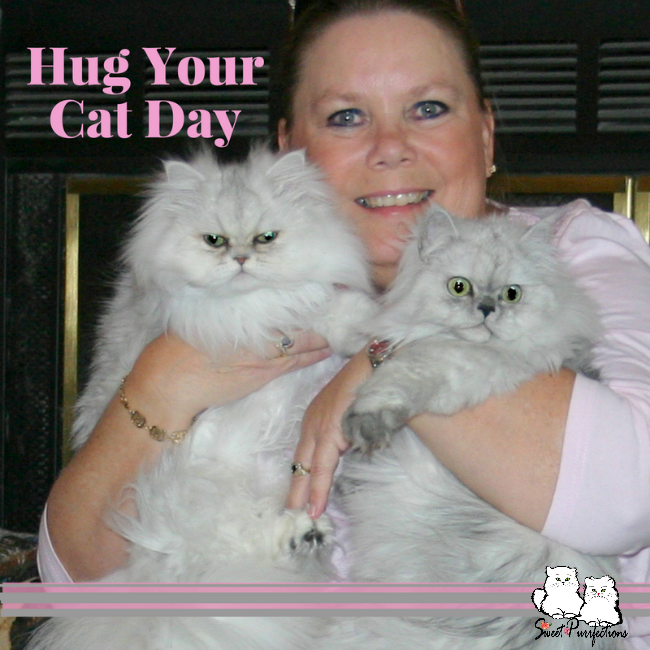 Today is Hug Your Cat Day; sometimes called National Hug Your Cat Day. Mom Paula loves to hug us, even though there are times we don't really want to be hugged or cuddled.Hugging cats is a pleasant experience for humans and some believe that it’s also beneficial for human health. Who hasn’t picked up their feline and felt instant relaxation when that purring ball of fur was in your arms? We know there are some kitties who don't like to be cuddled and we're sure the humans can find those special ways to let their felines know they are loved. Truffle and Brulee will let me hug and cuddle them, but only on their terms. We hope you are able to have some cuddling time with your felines today (and every day). Mom Paula: I love cuddling Truffle and Brulee and I'm lucky they don't mind being handled, even if it's on their own terms. I also love stuffed animals and have collected them since I was a child. I always tried to find a stuffed animal that had similar looks to my pets and my favorite was a stuffed Collie that had the same features as my real Collie. I began collecting stuffed cats when I was going through my divorce. My first stuffed cat was a white long-haired cat (white cat beside Truffle in photo below) that my mom gave me on the first Valentine's Day after my separation. I was able to get a seal-pointed Himalayan stuffed cat that was similar in color to Praline, but the facial markings were totally different. I've since collected several white cats (even one silvery-gray), but all of them had blue eyes. I've searched all over the Internet for a white cat with some silver in the fur and green eyes, but have been unsuccessful. 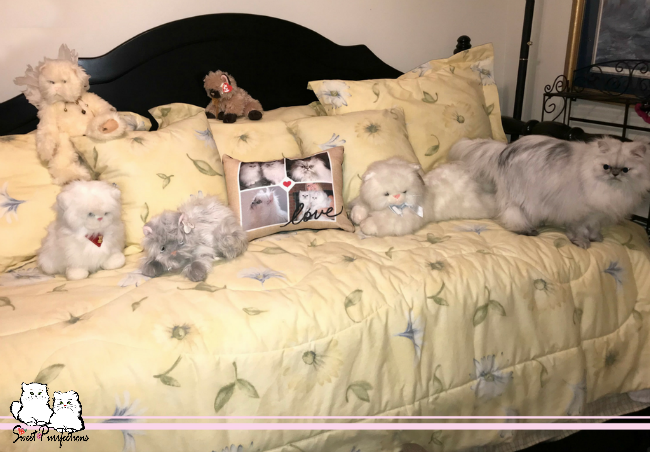 Why would a 60+ year old female want stuffed cats? To be honest, it brings me some comfort to see them lounging around in the guest bedroom. 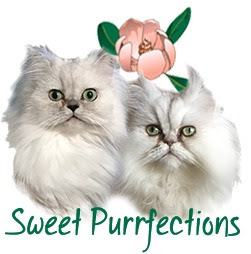 I first saw some Cuddle Clones® through some members of the pet blogging community and immediately fell in love. Cuddle Clones are custom-designed representations of a pet. Each Cuddle Clone is hand-designed by a team of skilled artists to help capture everything that makes your pet unique. Cuddle Clones makes a variety of custom pet products. There are the "plush" products: Plush Clone (the stuffed animal), slippers, golf head covers, and a holiday stocking. They also make figurines, ornaments, and memorials of your pet. Watch this short video from Cuddle Clones to learn about these unique plush products. Truffle and Brulee have a special bond with me and I truly miss them when I'm traveling. I know other people have an amazing bond with their fur companions, but sometimes that bond is disrupted through travel, children going away to college, military deployment, or the loss of a pet. I've read some reviews from people about Cuddle Clones and one truly touched me when the mother talked about a young child losing her beloved dog and she was inconsolable for a couple of years. The family wasn't able to get another pet at the time, but they found the Cuddle Clones and had one made of the dog who had died. The story brought tears to my eyes because of the difference the Cuddle Clone of her pet made. The mother stated her daughter has healed so much because of the Cuddle Clones. I was given the opportunity to receive a Cuddle Clones to review and share with our readers. I chose to use Truffle for my first Plush Pet (I will definitely order a Cuddle Clones of Brulee and Praline in the future). Ordering a Cuddle Clones Plush Pet was pretty easy once you found the right photos. The clearer and more detailed photos are important in designing a true representation of your fur child. The first design process is to give basic information about your pet. 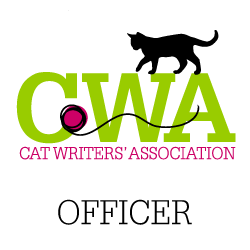 You provide your pet's name, identify the species and breed of your pet. From there, you upload photos of your pet's face, right side, backside, left side, chest, and tail. This actually took a little longer than I thought it would because I had to search for specific photos that showed the backside and the face. After general information is collected, you are sent to the "specifics" section to identify eye color and the tail (tail or not). 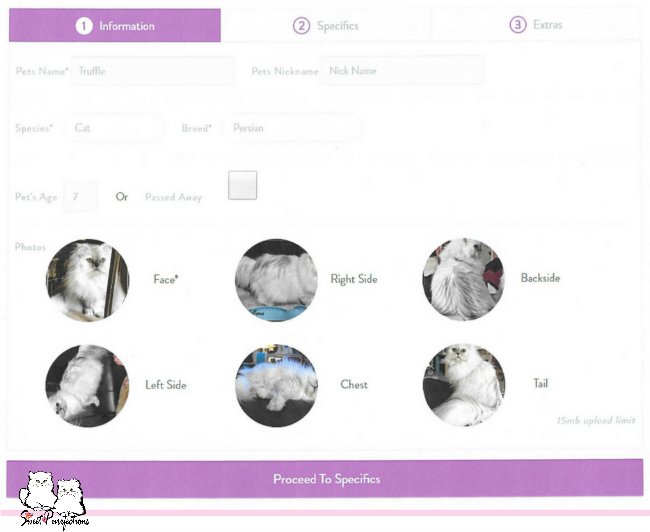 The last section is the "extras" section and this is where you can identify up to three specific characteristics of your pet that makes them unique and you can add additional photos that focus on these features. I focused on the silver tips in Truffle's fur, her large green eyes, and the length and fullness of her coat. You have the choice of the pet sitting or lying down. The last step was to place the order. A custom plush clone runs from $179 - $249. 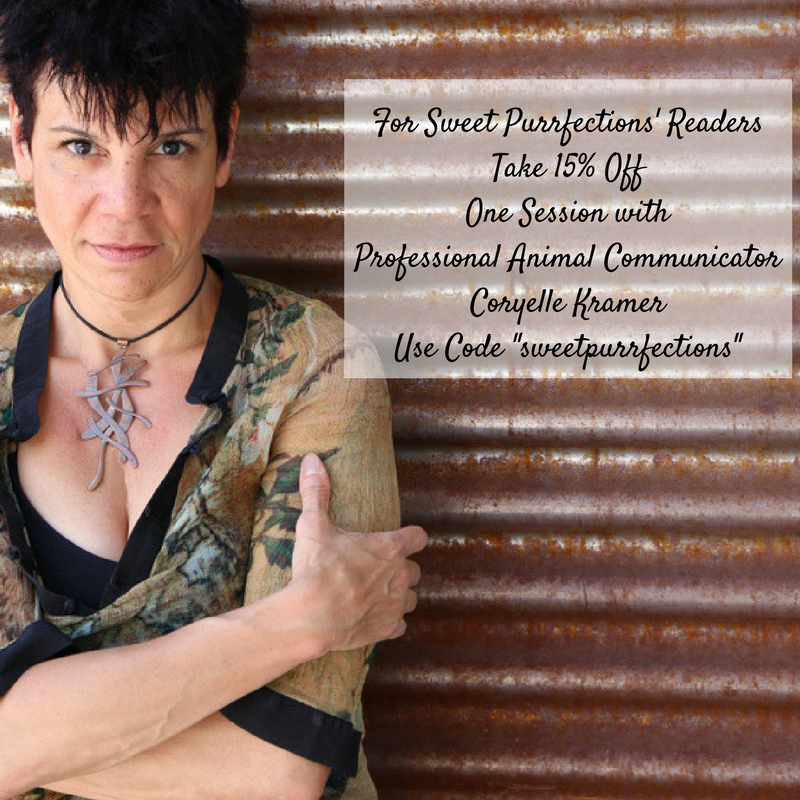 We do have a 10% discount for our readers if you click the graphic on our sidebar and use the code: TRUFFLE. On average, it takes approximately 8 weeks to get your Cuddle Clones Plush Clone once you've submitted the information and payment. I received an email after about a week of my order with photos (views of all sides) of the first draft of Truffle. I look back on those first photos and other than the coloring of her fur, it looked great. I realized that some of my photos made Truffle's face around her eyes and nose look tan instead of gray. Even though I loved the first draft, I wanted the coloring to be correct, so I sent the representative some additional photos of Truffle's face. I received some additional photos of the next draft a couple of weeks later. The representative was very patient with me with all of my requests for redesigns. We did get the coloring correct, but the face still wasn't quite right. I sent some more photos and more models were made. One thing I had to remind myself was that this was a stuffed version of Truffle and I couldn't expect it to look exactly like her. I was trying to capture her personality in the Cuddle Clones Plush Clone. Once I okayed a draft of Truffle, it was shipped to me and arrived within two days! I couldn't believe how much it looked like Truffle. I was allowed to work with Cuddle Clones on the revisions because of the sponsorship. Normally, Cuddle Clones will send the item to the person as soon as it is completed. If there is something major wrong, they will remake it or offer their money back guarantee. More details about this is available on the website. Truffle is a lot smaller than she looks in photos and her Cuddle Clones® Plush Clone is slightly larger than she is. However, they were able to capture Truffle's personality in her face with the Plush Clone. Every time I walk past the Plush Clone, I have to do a double take because I think it's Truffle. I've even found myself talking to it because it looks so much like Truffle. I am so impressed with the results that I am going to save up to order a Cuddle Clones® Plush Clone of Brulee and Praline. These items are amazing! The idea for Cuddle Clones began with an idea founder, Jennifer Williams, had while napping next to her dog in August 2005. Cuddle Clones became an LLC and designed their first Plush Clone in 2010. The first fully functioning website was available in May 2013. 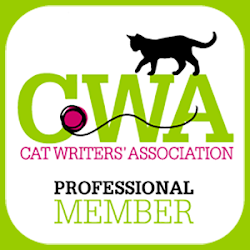 Cuddle Clones acquired Cartoonize My Pet LLC in August 2016. 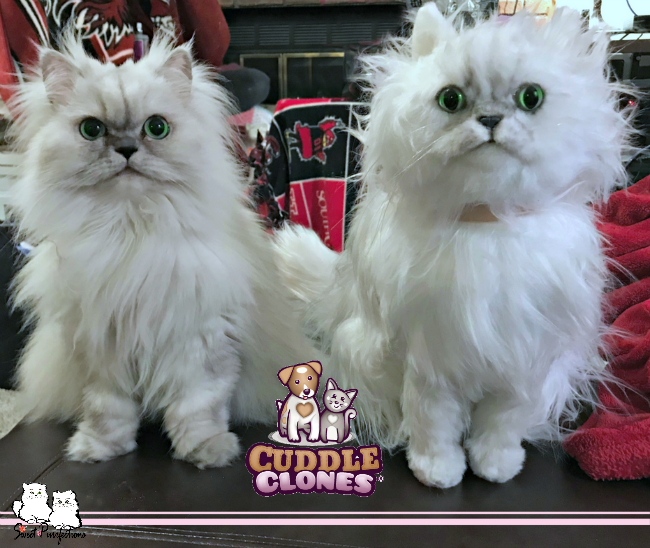 Cuddle Clones recently released Cuddle Clones 2.0 this month with more features that help in designing your pet. Cuddle Clones donates 10% of all profits to animals in need. Every month, Cuddle Clones donates to an animal-wellness organization, a pet shelter, and an animal in need. Cuddle Clones provides a 100% Quality Guarantee and is the only custom plush manufacturer to offer a full refund. Returned Cuddle Clones are donated to various local organizations where they can spread comfort and joy to people. 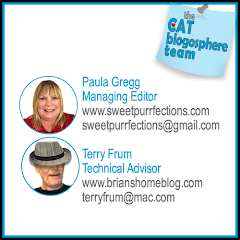 You can read more about Cuddle Clones® by visiting their website. You are encouraged to visit them on Facebook, Instagram, Twitter, Pinterest, and YouTube. Now for the exciting news! 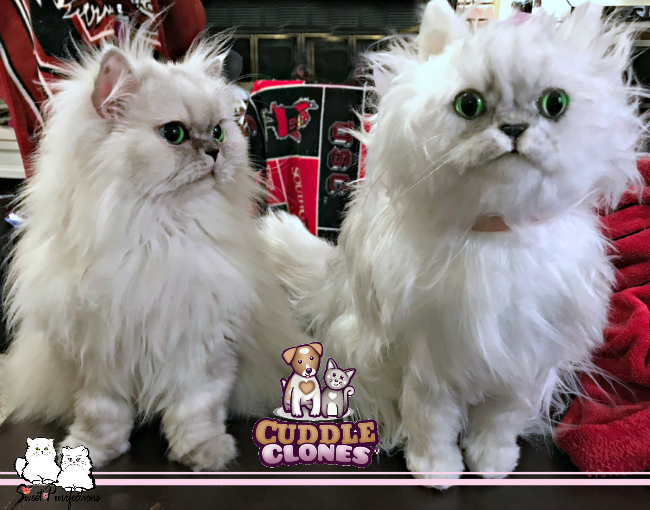 Cuddle Clones has agreed to let us host a giveaway where one of our readers can receive a Cuddle Clones Plush Clone of her pet. No purchase is necessary. The giveaway is open to residents Internationally. Yes, you heard us correctly! This is open to our friends from around the World as long as you 18+ years, except where prohibited by law. The giveaway will run from June 5 - 25 2018 and end at 11:59pm ET. One winner will be randomly selected by Rafflecopter (powered by Random.org) and notified via email. Winner will have 48 hours to claim her prize; failure to do so will result in forfeiture of the prize and a new winner will be randomly chosen. To qualify for the giveaway, a comment must be left on our blog post (make sure you indicate you commented on the Rafflecopter app). Since this is an International giveaway, everyone will be required to answer a simple question before having access to the optional entries. People who choose to leave their email addresses (optional) on the Rafflecopter app will receive a special discount code from Cuddle Clones®. Your email address will be shared with the company. Other entry options are available after a comment and an answer to the question is left. 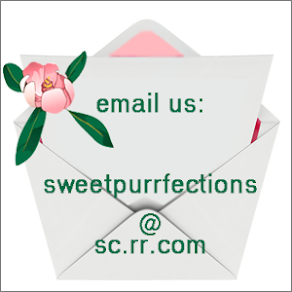 Please check your email and be sure to add sweetpurrfections@sc.rr.com to your address book! Good luck! I like that they look so real. I would have my kitty that crossed rainbow bridge made. I miss her. I totally understand. 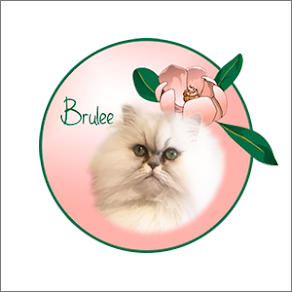 I plan on having one made of Praline, my first Persian who crossed the Rainbow Bridge 7 years ago. I still miss her. I think this is a wonderful idea! My cat Toby deserves a clone! We luv how realistic they are! My momma says if we won, she'd make a Cuddle ME (most orange tabby stuffed animals are too dark to look like me). Wow, that is an amazing plush Truffle clone! It really did capture her personality. My dog is away at a friend's house this week because I am having surgery today. It would be neat to have a cuddle clone version of her. How lovely. I would so love one of those of my GJ . I commented on the app. I think the cuddle clones would be great for our servicemen and women when they are away from their pets so they can feel close to them. I was given a stuffed animal cat when I was away from mine it helped as I missed them dearly. I've wanted a Cuddle Clones of Jewel for years. I just haven't been able to save up for one. I love how they cn make the stuffed animal look so much like our beloved pets! I would get a Cuddle Clone of one of my two service dogs that has crossed the Bridge. I like that they are realistic representations. We would definitely want our own cuddle clone stuffed animal. Truly amazing how they got Truffle's look spot on! I've admired Cuddle Clones for awhile because they're so lifelike. Sometimes I can't tell which is the real animal and which is the clone. I have nine dogs so it would be hard to choose but probably Norma Jean, my special girl. I love just how realistic these look - and how they really do look just like the pet they are made to look like. 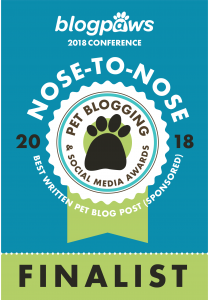 Gee, which furbaby would I have made if I win? That's a hard one. I think I might have to pick my Kyoko - she was a beautiful Treeing Walker Coonhound who I lost the day after Thanksgiving this past year. Either that or my beautiful Anya - I lost my beautiful white Angora kitty a while back, but of all the cats I've had over the years, she would have to be my "heart" cat. TW would love to have a Cuddle Clone of me but it's not in the budget like so many other things. I'd rather she take that to conferences than HHGutt. I love how realistic it looks! If I won, I would definitely to get a cuddle clone done of my dog Gavan that passed away last June. Those are just the coolest thing we've seen in a while! i have been wanting one of these for a very long time. i love that they look so realistic. i would want one of my dog, Evie, who passed away from cancer in Aug. she was my heart dog. she had such a strong will to live and fought the cancer battle for almost a year, 10 months longer than everyone thought she would live. This is an amazing giveaway. I would have one of my angels made, either Lucy or Phoebe. I love the detail and accuracy of the stuffed animal. I would get one made of one of my cats. It would be hard to choose between the brothers, but probably start with Kit because he has very distinctive markings. The Cuddle Cones are SO realistic looking! The mom doesn't know which one of us she would choose a clone of...she'd have to buy two more! I'm a stuffie fanatic and I've coveted a Cuddle Clone for a long time now. I'm not sure if I would choose Mudpie or Truffles right now. Pawsome giveaway! I would be thrilled to own a Cuddle Clone. I would make it Bianca. By the way, I have never been on Pintarest...don;t even know what it is. So I can't follow the girls there. I would make a cuddle clone of my little Ellie! These are so great!! I love Cuddle Clones because they make them look so much like our pets! I would love to have one of my dog Missy who passed away 2 years ago on Father's Day of severe stomach cancer. I'd even give it to my Dad because he was very close to Missy and had such an amazing bond with her. Thank you for the opportunity! Wow, that is amazing! It really does look like Truffle! We would probably have a Cuddle Clone made of Moosey, or maybe Sammy. I think what I like about Cuddle Clones the most isif you have a pet that passed you can have a reminder, and this would be great for the elderly who might connect. I would have a tough time deciding, but I would likely have my cat Tan'na done. As you can see, I us that name in his honor, and have since 1998. The plushy is a very good likeness of Truffle! Miss Paula, that means plushy Truffle can go places with you where her muse cannot. Mom still has many of her plushy pals from when she was younger. She got me a plushy Grumpy Cat a few years ago. I don't have a cuddle cone though. Purrs. Wow, what a great giveaway! The company does such a good job with likeness, it's amazing! I'd probably choose Dexter to clone since he's my first cat. Gotta go in order, I suppose! Mr. Jack says he wants a cuddle clone but Scout says there can only be one of her. How cold that this is an international giveaway, yay! This is a FABulous giveaway!!!!!! I can see Harvey looking at the How To out of the corner of my eye! As two of my kitties get older I would love to have a cuddle clone to remember them by when the awful day comes that I have to let them go. Romeo is my cuddle boy so I'd definitely start with him! Wow, that is so realistic! Very impressive. Thanks for the giveaway! Your Cuddle Clone looks amazing! I don't know if you ever saw the one I got of my soul kitty Annabelle, but it looks just like her, and I totally love it. I cried like a baby when I took it out of the box the day it arrived. Annabelle is still with me but I know that when the day comes and she has to go to the bridge, her cuddle clone is going to provide comfort. These Cuddle Clones are so amazing - I've seen many of them and I can't believe how lifelike they are! I've always wanted one but couldn't really swing the cost. My favorite thing about them is that they're so lifelike, I'd love to get one made of my Husky, Icy. Her look is so unique, and when I see stuffed animals of Huskies they never look quite Husky-like! Yours came out amazing, I looked at the photo and it's so hard to tell which is the Cuddle Clone! It looks uncannily like Truffle! I'd love one of Mr. N. It would also probably be life-sized of him! If your Truffle Cuddle Clone wasn't slightly taller than Truffle, I don't think I could tell them apart. After watching their video, I got all excited! They have Cuddle Clone Slippers! I wonder if I could have Bernie on one foot and Lizzie on the other. I may need to investigate this for a future dog mom present. These are quite good clones! Wow. Fortunately, Cookie is quite affectionate. Truffle's cuddle clone looks really good! My cat was not super cuddly, he would sit in our laps when he felt like it, but I don't think he would have enjoyed a hug either. My dogs all seem to enjoy hugs and cuddling. Paula, I already commented so I will share a lot this week for you on FB and on Twitter with the Crew. I don't think I can swing Instagram but you can I guess! They are amazing how much they look alike. What fun to have one. I just love them! The pic of Truffle looking at her Clone is just priceless! I have always been interested in doing Cuddle Clones of each of my FiveSibes! I would love one of my furangel Gibson, and then one of each of them for a full set! I keep thinking this is what I want to ask my hubby for a Christmas gift. If I won one, that leaves just four to get! ;-) What a terrific giveaway! Thanks for hosting! PS - I commented before reading your question! What I like best about the Cuddle Clones is how real they look and the incredible likeness! I would love to win this giveaway. I hope I win. What a great giveaway. I like how the stuffed animal looks so much like the real thing. This would something memorable to have. I would get the doll to look my Daisy Mae. Sorry but didn't know I was to do this. I really want to win. 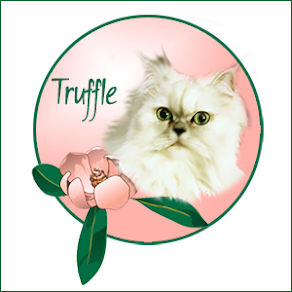 Will the real Truffle please stand up? Our mom would LOVE to have one of these! So cute! I just wish they wern't so expensive. I've been wanting one made to look like my dogs for years but keep putting it off because of the price. I'm sure they're worth it, I just have a lot of other things to spend money on (like dog toys lol). Someday I'll get one! Cuddle clones were so life like of our pets. Hoping to have one of my beloved pet, it will surely help us to cope up from her loss. She live with us for 13 and a half years and it wasn't that easy to let her go. She passed away just 1 month ago. I've been missing her so badly everyday, that's when i found the cuddle clones stuff and it gave me the hope to see my beloved dog once again at home, but its too expensive I can't afford it yet... If chosen, i would like to have a clone of her. Thank you for this amazing opportunity for everyone and God bless.. These are really remarkable. I would love to have one of our Angel Tommie. I wonder if I can find photographs of all those different poses, even though I took tons of pictures of him over the years. Thank you for sharing this company and the information. I was still on holiday when you posted about the Cuddle Clones and only saw about it on your latest post. They are so lifelike and I would like to enter. It would be wonderful if I could win a Flynn Clone. What an amazing likeness for both Truffle and Brulee. That is simply amazing. I wonder if my heart could stand seeing a likeness of Abby? This is really remarkable. They look so real! I want to get one for Buffy! I've heard of Cuddle Clones and I want to get one of Wynston! I want to get one made while he's alive so when he passes a long time from now, I have the memories of Wynston being next to his Cuddle Clone. I love the memorial aspect of cuddle clones. I would love one of my sweet departed StarLord. We only got to spend 2 short months with our sweet boy before a health issue took him from us at 1 year old. We adopted him after he spent months at the shelter because he had a facial growth and no one was interested in him. The moment my fiance and I meet him we knew he was ours. He will always be my first baby and I would love a reminder of him. I want a Cuddle Clone of Kilo the Pug so badly. 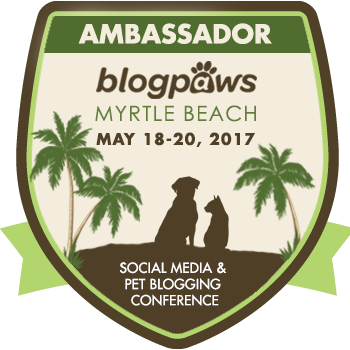 I saw some of dogs at BlogPaws that were so real and now yours is amazing!!! Kilo is so cute but weirdly I can never find a plush black pug. I know what you mean. I eventually plan on getting one of Brulee and Praline. I think I need these for all three pets. I've been collecting artist portraits of them in various mediums and this one rocks. I would love to do my black lab Steel. I love how realistic they appear to be. I would get my daughter's dog done for her. I really appreciate how customizable they are. I love how personalized this gift can be and I would love to win this for my daughter and her dog. I recently lost my cat - about a month ago, & I would LOVE to have one that looks like her. I had her for 17 years..I sure do miss her! Which one is THE REAL TRUFFLES!? We honestly couldn't tell! I can't imagine what Peaches (or Paprika) would do with or to a clone of herself but it sounds like a real adventure! What a neat idea. We're certainly up for the challenge! We completed the Rafflecopter. Wow- That's amazing!!!!! We would love one of those! I can't believe the quality of the clone, they're almost identical. I would love to make a clone of my dog Coke. My favorite thing about the Cuddle Clones is how real the pets look. I would love to have my doggy Sheba done. She means to world to our family and this would be amazing! I love that they look real, and my daughter could cuddle it!! My sweet Lily! She's the sweetest cat ever. I LOVE this idea! We all known how finicky our felines can get! Being able to cuddle up to their clone anytime WE wanted (not just their choice) sounds great! I would clone my boy Morgan! He is the softest kitty ever! I want to win the cuddle clone. I would clone Daisy Mae. Great Idea. I hope I win.